Birmingham is a major metropolitan city in the West midlands of England. It is England's second largest and most ethnically diverse city. The City has a population of 992,100. More than five million people live in the surrounding regions. Alexander Parkes Brummie invented the celluloid in Birmingham, which was the basis for film and photography, the backbone of today's media. The Birmingham Post was launched in the year 1857 by an Irishman John Frederick Feeney as a Monday to Friday Paper of four pages and priced at one penny. In November 1997 Mirror Group acquired MIN for Â£305 million, and in September 1999 Trinity and Mirror Group merged to become the biggest newspaper publisher in the UK. The Birmingham Post provides high quality, incisive news, business, arts, and lifestyle and sports coverage every morning except on Sundays. Currently Birmingham Post is the city's only regional broadsheet newspaper and with a circulation of over 16,000 copies has the most affluent professional readership in the region. John Frederick launched the Evening mail in the year 1870. The Evening Mail has been providing Birmingham and surrounding areas with unrivalled coverage for more than 130 years and reaches more than 30 per cent of the population in its core circulation areas, outselling all its competitors. The Evening Mail of Birmingham sells an average of 104,219 copies every weekday. It's coverage of news, sport and features is up-to-date and the readers do not feel the need to buy a national daily newspaper. The main edition of Evening Mail in Birmingham is updated five times throughout the day, bringing readers the latest news and sports events as they happen. There are separate editions covering the Black Country, Solihull, Staffordshire and Worcestershire. 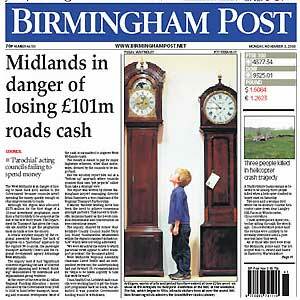 Birmingham News is a freely circulated magazine with a massive distribution reaching more than 158,000 readers. It is circulated on Thursdays and belongs to The Trinity Mirror, the same publishing house that owns The Birmingham post and The Evening mail.